In the 1920s, Japan began to translate its growing economic might -- after a prior 50-year crash course in Western capitalism and industrialization -- into formidable military power. At first, few of its possible rivals seemed to care. America and condescending European colonials did not quite believe that any Asian power could ever dare to threaten their own Pacific interests. Japan had been a British ally and a partner of the democracies in World War I. Most of its engineering talent was trained in Britain and France. The West even declared Japan to be one of the "Big Five" world economic powers that shared common interests in peace, prosperity and global security. Occasional parliamentary reforms had convinced many in the West that Japan's growing standard of living would eventually ensure cultural and political liberality. That was a comforting dream, given that by the 1930s Americans were disillusioned over the cost of their recent intervention in the Great War in Europe. They were weary of overseas engagement and just wanted a return to normalcy. A terrible decade-long depression at home only added to the popular American desire for isolation from the world's problems. Americans sympathized with China's security worries -- but not enough to do much other than hector Japanese military governments with haughty sermons about fair play and international law, and threaten to impose crippling embargoes. Japan ignored such sanctimoniousness. Instead, it harangued its Asian neighbors on the evils of Western colonialism and the need for them to combine under Japan's own tutorship to reassert their Asian influence in world politics. The League of Nations did nothing when Japan began colonizing Manchuria in 1931. Westerners seemed more impressed by the astonishing rate of Japanese economic progress and growing armed clout than they were determined to stop Japanese aggression. By 1941, few Americans were even aware that the Imperial Japanese Navy had almost magically grown more powerful than the Pacific fleet of the United States in every category of battleships, carriers, cruisers, destroyers and submarines. The idea that Japan was waiting for an opportune moment to exploit American weakness, at a time when Europe was convulsed in war, would have seemed absurd to most Americans. The 1940 American relocation of its Pacific Fleet home port from San Diego to an exposed Pearl Harbor was supposed to deter Japan. But the Japanese interpreted such muscle-flexing as empty braggadocio, if not more foolhardily symbolism. The attack on Pearl Harbor followed. Substitute communist China for imperial Japan, and the same thing is now occurring in the Pacific. 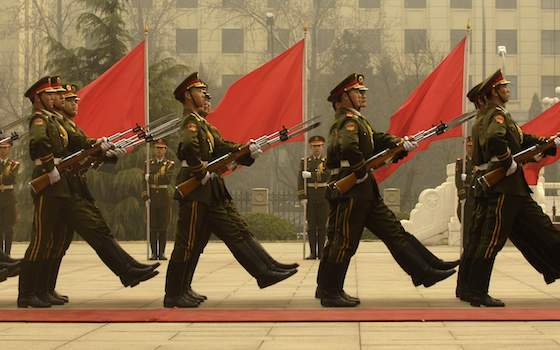 China believes it is finally time to make its military reflect its enormous economic power. Chinese armed forces are growing while America's are shrinking. China does not like visiting American blowhards -- most recently, Vice President Joe Biden -- lecturing them on human rights, especially when American power, both military and economic, appears to be waning. If the Japanese of the 1930s once talked of Western decadence and American frivolity, so too the Chinese now sense that American global influence is not being earned by the current generation of Americans that enjoys the high life on $17 trillion in borrowed money, much of it from China. China likewise senses growing American isolationism, hears parlor talk about the U.S. reducing its nuclear arsenal, and notices America's new habit of distancing itself from allies. Americans once talked tough about Iraq, Iran, Afghanistan, Libya and Syria. But China tuned out that empty rhetoric and instead noted that we abandoned Iraq after the successful surge, are exhausted by Afghanistan, were humiliated by Bashar Assad in Syria, and were seemingly paid back with Benghazi after removing Muammar Gadhafi in Libya. China is reassured that what America says and what America does are not quite the same things. More importantly, the Chinese also appear to hate the Japanese in the same way the latter apparently despised the former in the 1930s. China resents Japan's undeniable lack of contrition over the approximately 15 million Chinese killed by Japanese aggression in World War II. The Chinese also sense that Japan may be a has-been power, with an aging, shrinking population; energy woes; a sluggish, deflationary economy; and increasingly without its once ubiquitous American patron at its side. China accepts that the U.N., like the old League of Nations, is useless in solving global tensions, and prefers that it is so. Add everything up and China seems about as confident of the future as Japan once was in the 1930s. It is as eager to teach Japan a lesson, as Japan once did China. America once again appears confused by these radical changes in the Pacific. That is, until someone in the region tries something stupid -- once again. Article: Copyright ©, Tribune Content Agency.